Whether in response to public policy or concerns about infrastructure, all of America seems to be talking about construction costs. As a company on the forefront of the construction industry, we welcome the conversation, and we would like to add our expertise. Every month, we’ll examine the long-term cost trends of the industry’s most vital materials. In this edition of What the Data Says, we take our first look at wood. People have been building structures with wood for thousands of years—since before the invention of the ax. Since then, its use in construction has become more sophisticated. Wood is overwhelmingly the material of choice in residential construction framing, and the popularity of wood framing is on the rise in the commercial space. Framing aside, wood is commonly used for flooring, door and window trim, molding and trusses. It’s easy to understand wood’s popularity: The material is plentiful, durable, strong and, depending on how it’s sourced, renewable. Gordian regularly collects, validates and analyzes North American construction material costs to maintain RSMeans data, our construction costs database. RSMeans data contains more than 55,000 material costs localized to 970+ locations. Thanks to the 22,000+ hours of research we devote to construction costs every year, we can examine the price of wood and tens of thousands of other line items from every corner of the U.S. and Canada. We tracked the value of this index in 30 cities from Q3 of 2014 to Q1 of 2018. Additionally, we looked at the data grouped into U.S. census districts. If this is your first interaction with this series, you’ll benefit from a quick explanation about what we’re tracking. The baseline for the index is 100- that’s our starting point. We’ll be looking at cost fluctuations in relation to that point. The value of the wood index remained fairly flat for most of the time period we studied, swinging eight percent at most from quarter-to-quarter until Q3 of 2017, when the index value jumped from 111 to 121. Though this represents a large spike for wood, it is a modest gain when compared with steel or concrete. The data is more interesting when you consider wood index costs by census district. At the raw price level, they all move close together. 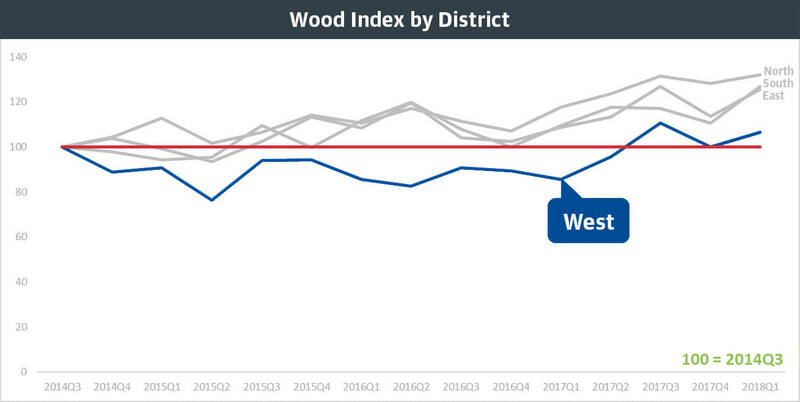 But when you normalize for their starting price, as we did in Q3 of 2014 with a baseline value of 100, you can see that the cost of wood in the West is consistently lower than in other districts. Overall, the cost of wood is as steady and reliable as wood itself. For the last few years, design professionals and contractors have enjoyed relative price stability for one of construction’s most popular materials. That’s what the data says. Find out more about RSMeans data.